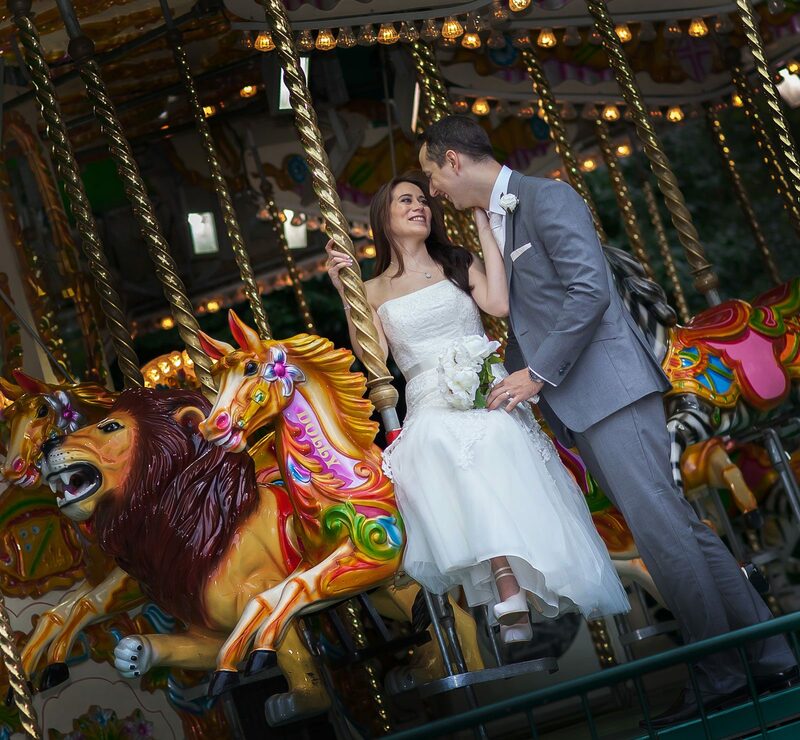 London Wedding Carousels, we love them! Apart from travelling fairs there are only a handful of London wedding carousels in the capital. What does that mean? 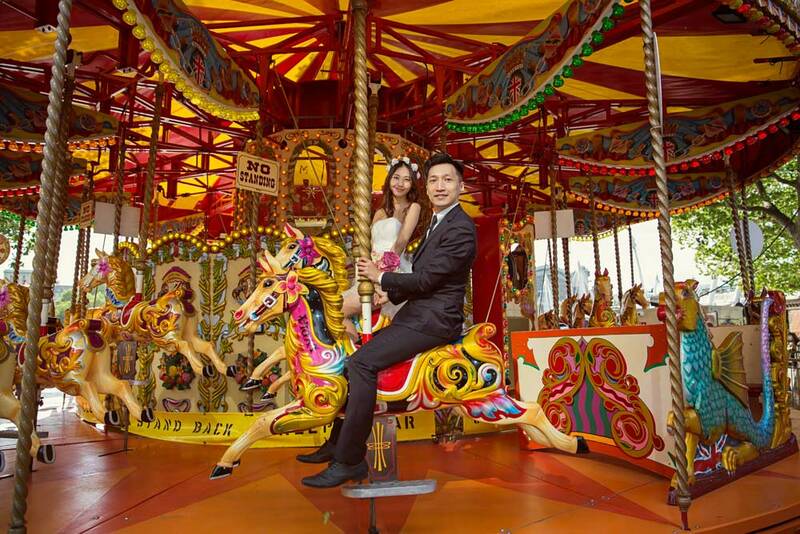 Well it means merry-go-round’s that are near enough to a wedding venue that they could be incorporated into London wedding photos. Does anyone care? Yes me, David! Originally I grew up in a seaside town with a fair at the end of the pier, the sights smell and sound of it became a large part of my childhood. All those gloss covered horses and carriages moving round and round and up and down at speed fascinated me. It was like a dizzy little world I could be a part of for a while. There was a time in England when these brightly coloured and loud distractions were a common sight, not just in seaside resorts but villages and cities too. These days you would be hard pressed to find one anywhere but a travelling fair. 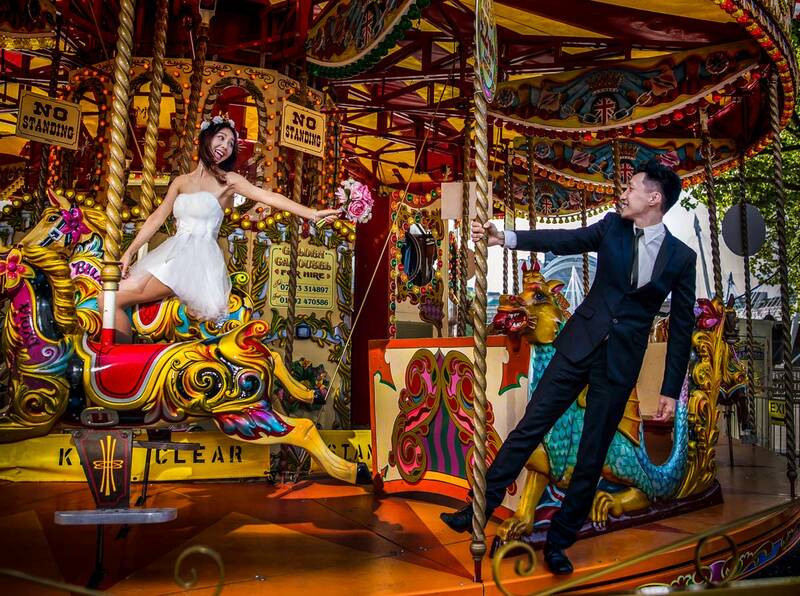 Joanna and I as London wedding photographers have been fortunate enough to photograph couples on their wedding day on these fantastic fairground attractions. There are two main carousels that we are aware of in the capital. Perhaps the most well known certainly with tourists is the one on the Southbank near the London Eye. Recently we photographed couple Natalie and Max there having a great time riding on it, after starting with them at Tower Bridge. 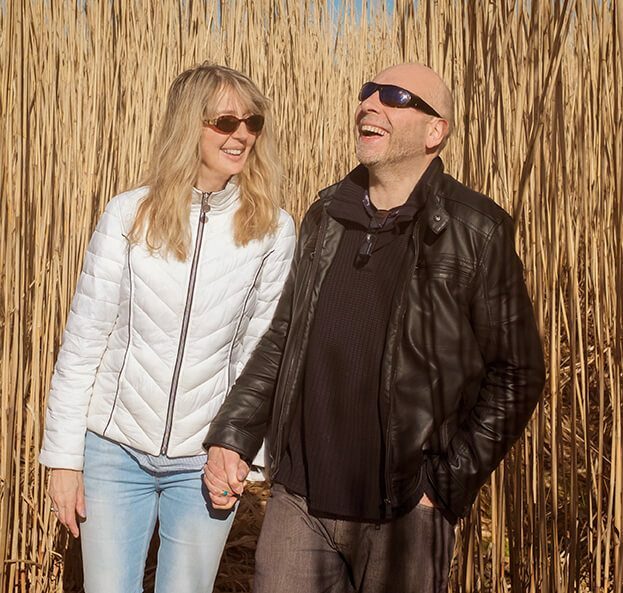 As you can see from a couple of their wedding images they certainly weren’t shy! Generally speaking when staff on rides such as these see it is two people in love, on one of the biggest day of their lives, they are pretty welcoming and flexible with allowing you to photograph. Well that is as long as your photographers are as charming and persuasive as apparently we are! The other much ridden merry-go-round is the one at London Zoo. 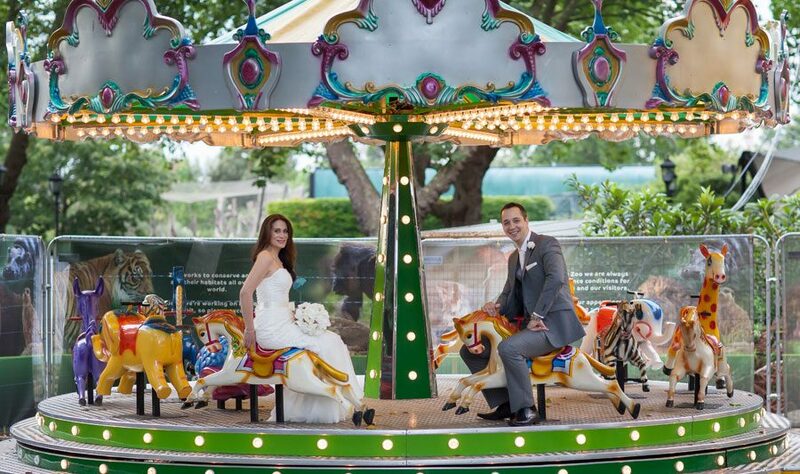 As veterans of London Zoo wedding ceremonies and receptions, it is definitely on the photographic “to do” list that the newly weds have a ride on the Zoo’s Carousel, as part of their time in one of the capital’s most famous and iconic destination venues. As long as you don’t get motion sickness everything should be ok! We’ve included a photo too of the mini carousel in the small children’s play area, because we found it quite funny when adults ride it looking like giants. As it’s an easily moveable one though so it doesn’t strictly qualify as a London wedding carousel. You have to look hard these days to find permanent carousels (if you didn’t know originating from the French word: carrousel). On our travels in France though, photographing destination weddings, we often encounter them in towns and villages where they are still big tradition for children and adults alike. In a rapidly changing world its nice to see a little bit of tradition that lasts, and even better when we get to photograph that tradition in action.